Something which can not be proved. To show that an assertion, claim, etc. is false, invalid, or wrong; to refute; to invalidate. 1. One who disproves or confutes. 2. A debater who refutes or disproves by offering contrary evidence or argument; rebutter, refuter, confuter. 1. Capable of being disproved. 2. Open to argument or debate. 3. Not definitely true or valid, and so it is debatable or open to argument. A reference to something which is open to dispute; debatable: "Her testimony was disputably inaccurate." 1. Someone who is good at, or who enjoys controversy. 2. Those who are involved in arguments or legal disputes. 3. 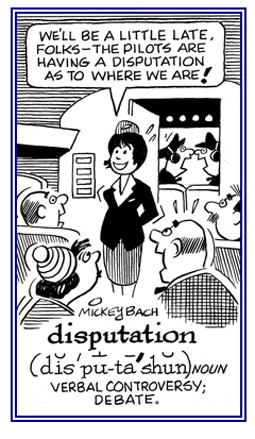 A person who disputes; a debater. 1. The formal presentation of, and opposition to, a stated proposition (usually followed by a vote): There were significant disputations between the teachers’ union and the local government over contract negotiations. 2. The act of debating; a verbal controversy: Before the election, there were several disputations scheduled among the candidates so voters might be able to have a better understanding of the issues. 3. An oral defense or debate of an academic’s thesis: The science department at the university scheduled a disputation of Mike's thesis to take place next Monday afternoon. © ALL rights are reserved. 1. Inclined or showing an inclination to dispute or disagree, even to engage in law suits. 2. A tendency to argue or disagree without adequate cause. 3. Being fond of, or given to, disputation; argumentative; contentious. 1. In a disputatious manner. 2. A reference relating to something that is in question as to its value or intent. 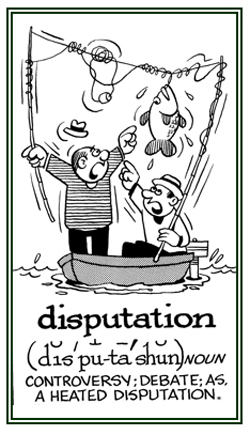 A disagreement or argument about something important. 1. 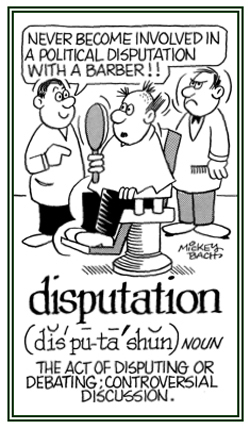 Someone who engages in discussion or argument; a debater. 2. Anyone who quarrels angrily. Showing page 23 out of 35 pages of 513 main-word entries or main-word-entry groups.